Invited Lectures. Non-Linear Completely Positive Maps (T. Ando and M.-D. Choi). 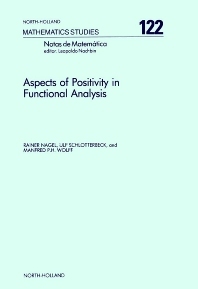 Generalizations of Self-Adjointness to Banach Spaces (R.G. Bartle). Simplices in Potential Theory (H. Bauer). Spectral Properties of Some Second Order Elliptic Operators on Lp-Spaces (E.B. Davies). Asymptotics for Bounded Semigroups on Hilbert Space (J.A. Goldstein). Lp-Theory of Schrödinger Operators with a Singular Potential (T. Kato). Theory and Applications of Superconvex Spaces (H. König). On the Banach-Mazur Distance Between Spaces Having an Unconditional Basis (J. Lindenstrauss and A. Szankowski). Positive Linear Operators on Lp and the Doeblin Condition (H.P. Lotz). Local Operators, Space-Time Methods, and Evolution Equations of Diffusion Type (G. Lumer). Asymptotic Averages (W.A.J. Luxemburg). Short Communications. Integral Kernels and the Feynman-Kac Formalism (J.A. van Casteren). Characterization of Carleman Operators in Riesz Spaces (P. van Eldik). An Ergodic Property for Certain Classes of Nonlinear Positive Operators (T. Fujimoto and U. Krause). Markov Semigroups and Structured Population Dynamics (H.J.A.M. Heijmans). Invariant Cones in Real Lie Algebras (J. Hilgert and K.H. Hofmann). Dirichlet Forms on a Measure Space (F. Hirsch). Integral Representations of Stochastic Kernels (A. Iwanik). On Integration with Respect to a Trace (M. Leinert). Generators of Positive C - Semigroups (S. Miyajima). Almost Uniform Convergence on the Predual of a von Neumann Algebra and an Ergodic Theorem (D. Petz). Spectrum-Preserving Linear Maps on the Algebra of Regular Operators (A.R. Sourour). An Extrapolation Theorem for the o-Spectrum (L. Weis). Positive Operators in Reggeon Field Theory, Why? (M. Zerner). The contributions collected in this volume exhibit the increasingly wide spectrum of applications of abstract order theory in analysis and show the possibilities of order-theoretical argumentation. The following areas are discussed: potential theory, partial differential operators of second order, Schrodinger operators, theory of convexity, one-parameter semigroups, Lie algebras, Markov processes, operator-algebras, noncommutative integration and geometry of Banach spaces.